Waves rolling in at Whale House Bay. 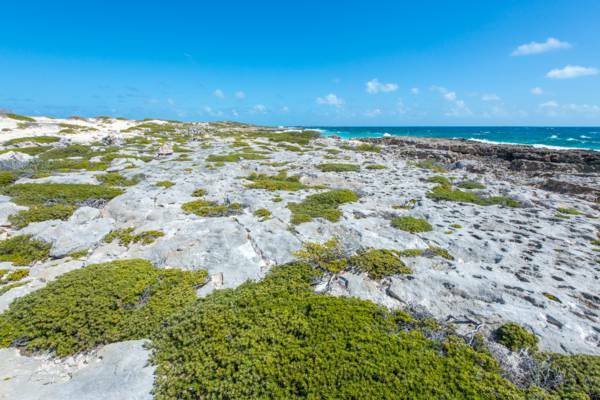 Whale House Bay is another secluded and scenic coastline to explore on Salt Cay. Typically not a good spot for swimming or snorkeling due to ocean conditions. Much of the vegetation here is low salt-resistant coastal plants. 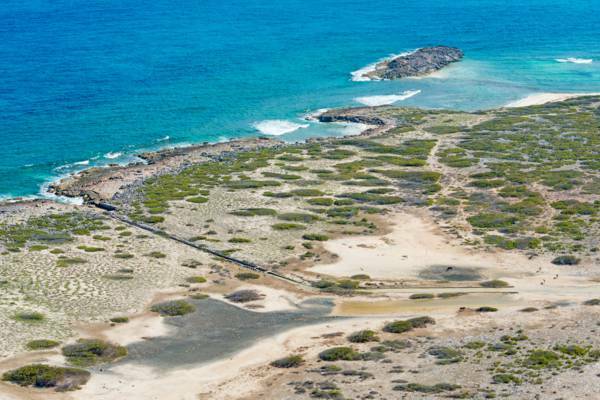 This 1400 feet (427 metres) beach is found between Long Bay Beach and Northeast Point. As is the case with the east coast, conditions here are usually rougher than those on the north and west coasts. The area is quite scenic and a great place to explore, take photos or beachcomb. Unsurprisingly, the rocky cay close off the coast here is named Whale Island. As the name suggests, Humpback Whales can be spotted off the coast here during the January to March whale season. Aerial photo of Whale House Bay. The island, cattle, donkeys, and the Grey Salina inlet can be seen. When in the area, you may also be interested in looking at the nearby site of the inlet to the Grey Salina. Although a rather minor feature, the ancient limestone stonework of this tiny salt pond feed canal is nevertheless beautiful, and a testament to the salt industry of days past. Whale House Bay is a little difficult to access. No drivable paths exist to this beach, so it’s necessary to walk over from the Long Bay beach track. 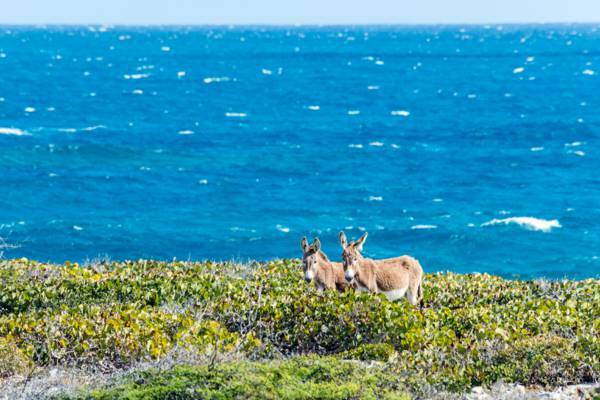 Feral Salt Cay donkeys foraging.